Several signs have been flashing for the past year that gold has become too big for its britches and will eventually adjust to a lower price which could push the yellow metal off the edge of a cliff to – dare I say – not just below $1100 or $1000 per troy ounce, but to $880ozt.! The above edited excerpts (and the edited/paraphrased copy below) are from an article* by Andrew Hecht (technomentals.com) originally entitled Why I See Gold Headed For $880. Uncertainty in terms of the future, a rising dollar and the prospect for higher interest rates has taken some of the luster off the yellow metal. The divergences in the precious metals sector weigh heavily on the price of gold and could be the impetus to push the yellow metal off the edge of a cliff. 1. The Silver Divergence Says Gold Should Be $872ozt. The silver-gold ratio represents the number of ounces of silver value in each ounce of gold value. You can calculate the ratio by dividing the price of one ounce of gold by the price of one ounce of silver. Over the past 40 years, the average level of this price relationship has been 55 ounces of silver to each ounce of gold…[and] the ratio has traded as high as 93.3:1 (in 1990) and as low as 15.5:1 (in 1979). the silver-gold ratio today stands at 74.4:1 which tells us that either silver is too cheap or gold is too expensive. At a silver price of $15.85 per ounce, a reversion to the mean reflects a gold price of $872. 2. The Platinum Divergence Says Gold Should Be $884/ozt. The platinum versus gold spread is the price differential, per ounce, between the two precious metals. platinum has many more industrial applications on a per ounce produced basis than does gold. Given the above it makes intuitive sense that platinum should trade at a premium to gold yet platinum is currently trading at an $87 dollar discount to the price of gold meaning that either platinum is too cheap or gold is too expensive on a historical basis. 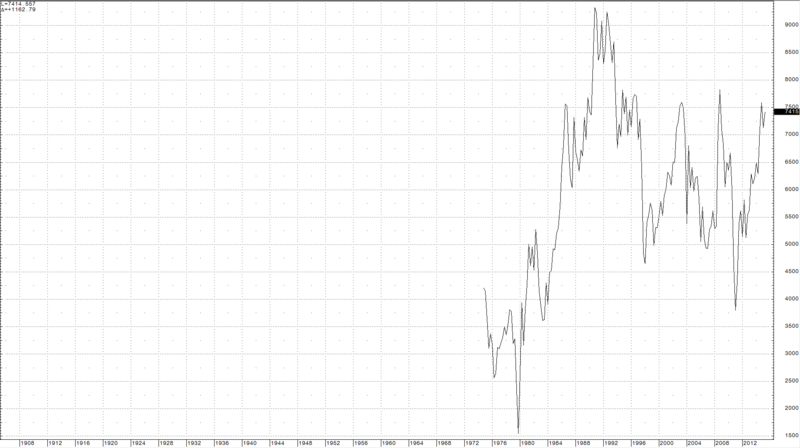 Thus, based on long-term historical norms, the price of platinum today at $1084 per ounce implies a gold price of $884. It is not that no one cares about gold these days, but less people certainly have the yellow metal on their radar than in the past few years as illustrated by the extent of open interest, the total number of long and short positions in the futures market, which has declined 28.8% since 2010 while, the price of the yellow metal has dropped just under 39%. 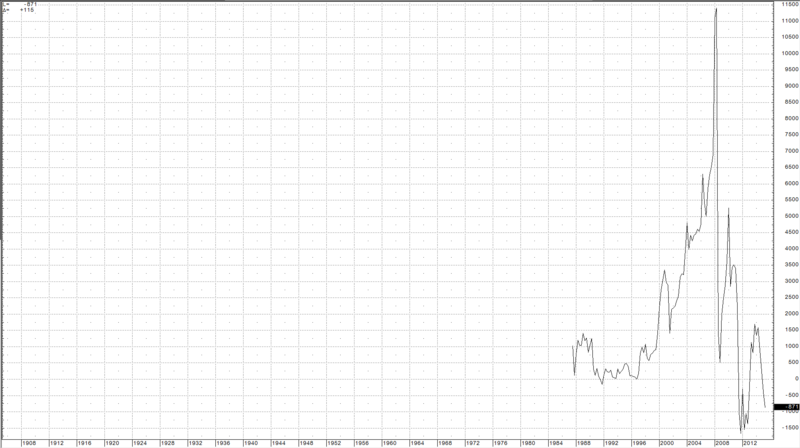 Oddly enough, both silver and platinum futures currently have the largest open interests in history. Platinum is currently less than half the price it was at the highs in 2008 but open interest today in platinum has increased of almost 600%. Open interest in silver today is almost twice what it was when silver was over three times higher than the current price level. The divergences in price coupled with the divergence in open interest highlights that something is out of whack in the precious metals sector these days. This tells me that a big move is on the horizon. The price divergences point a mean reversion in the historical price relationships between platinum, silver and gold. This is likely to translate into a lower price for gold. Higher interest rates are a huge negative for the price of gold as gold must compete with other assets for investment flows. Since gold pays no rate of interest, a higher interest rate environment raises the cost of carry for the yellow metal thus decreasing investment demand. Gold goes the way of investment demand. Lower investment demand makes gold heavier and more likely to fall. Rising interest rates in the U.S. coupled with a strong dollar and the prospect for even more strength in the greenback are negative for the price of gold. Given all of the above, I believe that the sweet spot for gold right now is the $880 per troy ounce level. It is just the case of a reversion to the mean. Rising U.S. interest rates and a stronger dollar are likely to be the impetus that gets gold moving lower in the near future. That is why I am making this bold call at this time. While I am probably more bearish than any other analyst out there these days, I believe that when gold corrects it will create an amazing buying opportunity. Monetary policy around the world has been to print money or fiat currencies to stimulate economies and there is often a lagged effect between monetary policy and its ultimate effects. As such, it is likely that all of this easing and cheap money will cause a bout of inflation down the road and when that happens, gold will shine again. Before that happens, however, I see gold dipping below $900 bucks, and when it does be sure to snap some up for the rainy day that is almost sure to come. 1. New Update: Gold & Silver Will Plummet In 1st Qtr. of 2016 – Then Go Parabolic! My new analyses of gold & silver indicates they will both continue to show weakness throughout the balance of 2015, plummet to $725ozt. & $12ozt. respectively, during the 1st. Qtr. of 2016 and then go absolutely parabolic in price by the end of 2016/early 2017. Below are the specific details of my forecasts (with charts) to help you reap substantial financial rewards should you wish to avail yourself of my insightful analyses. The internet is awash with analysts who believe that gold is going UP to $10,000 or DOWN to $1,000 and that silver is going DOWN to $15 or UP to $300. Such pundits (Roubini, Sinclair, Rickards, Willie and Edelson to name a few) grab a lot of attention in the media but are their prognostications worth paying attention to or are they just a lot of hot air? As I type this the price of gold is sitting at 1,094.10 per ounce, down -0.87% for the day so far. Looks like you could be correct with your prediction of sub $900 gold.